One of the greatest gifts a writer can have is that of a good relationship with an editor. When you have a good relationship with an editor, you will likely be asked to write for them more often. This is a perfect way to annoy an editor. Writer’s guidelines are written for a very good reason, to give guidelines and answers to commonly asked questions. Emailing an editor without bothering to read the guidelines is a clear sign to any editor that you didn’t do part of the job. Before you email an editor with a question be sure to read the writer’s guidelines. If there are no guidelines, which is sometimes the case, then email the editor with your question or questions. Remember that an editor is busy and having to reiterate answers for people who don’t want to read the guidelines is plain annoying. Submitting is a game of patience. After you submit an article or query it’s a waiting game. But don’t sit on your hands just waiting for an answer. Get to work on a new project. And don’t email the editor the next day to make sure they got your email or a week later to see if they’ve had a chance to read it yet. An editor gets many submissions and email for constant updates doesn’t make their job any easier. And remember that you’re likely not the only one doing it. That is grounds for frustration for an editor. Be patient and wait a suitable amount of time before you check in. This is similar to number two, but instead of emailing them for updates, you use social networking sites that you both belong to. This is a big no-no. An editor likely doesn’t want to deal with business while they are enjoying their time on social networking sites catching up with family and friends. Before you attempt this move, ask others if they’ve had experience with this editor. How long it took (approximately) to hear back, if they heard back at all. You might learn that a particular editor doesn’t answer except to accept pieces. So you’ve been asked to write an article, either for an editor you’ve worked with before or maybe you submitted a query that was accepted. Either way, the editor has likely seen examples of your writing. And being the smart writer you are, you’ve read back copies of the magazine and know their style quite well. You want to know if you’re on the right track so you email the editor your introduction. He says it’s very good, so you send him the next paragraph. Remember that this editor had enough faith in you to do a good job on the article. Send him the completed article and if he needs revisions done, he will tell you. 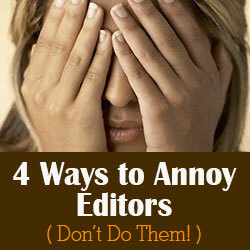 Do what you can to not annoy editors and you can form long-lasting relationships with them. 99% of the time guidelines are so confusing and poorly written – a better article would be “An editors guide to writing guidelines”. When they learn how to write guidelines, then they won’t have so many questions. Well, he is a she, but she agrees.